Because supporting one of the most underserved Duel Terminal Archetypes of all time should be a breeze. Not the one Noella summon of course, that's for Friday. Specifically THIS FRIDAY THE 7TH. 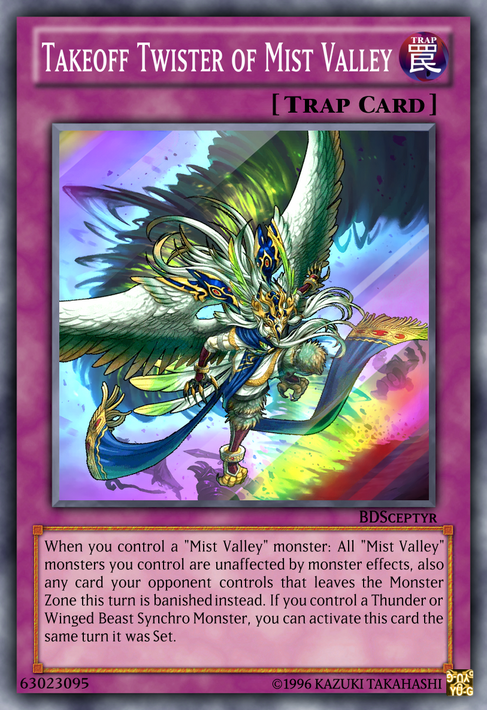 Lore: If a "Mist Valley" monster(s) is Normal or Special Summoned from the hand: You can Special Summon this card from your GY, then Special Summon 1 "Mist Valley" monster from your Deck with 1000 or more ATK to your opponent's side of the field, but banish this card when it leaves the field. While your opponent controls a WIND monster, this card gains 1 Level. You can only Summon "Mist Valley Wing Anapriya(s)" once per turn. 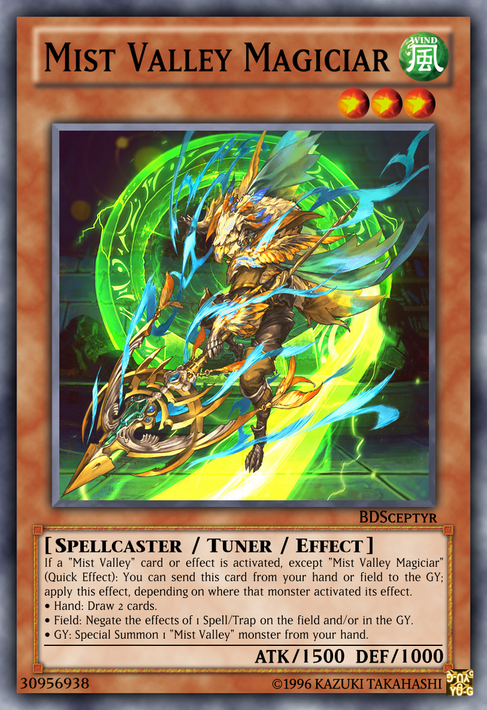 Lore: If a "Mist Valley" card or effect is activated, except "Mist Valley Magiciar" (Quick Effect): You can send this card from your hand or field to the GY; apply this effect, depending on where that monster activated its effect. • Hand: Draw 2 cards. • Field: Negate the effects of 1 Spell/Trap on the field and/or in the GY. 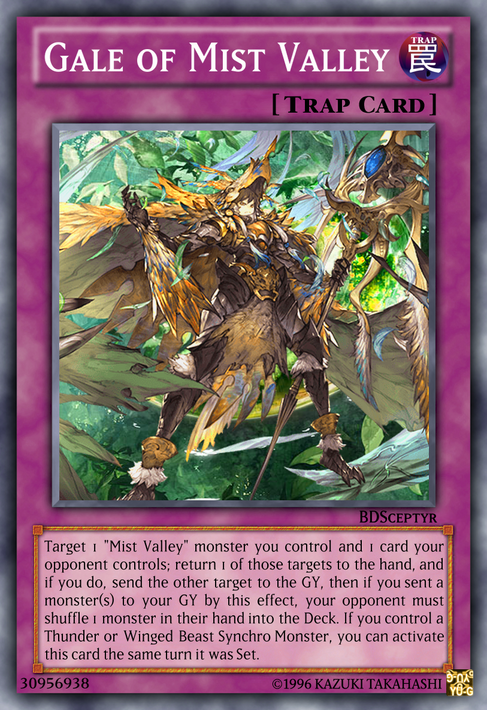 • GY: Special Summon 1 "Mist Valley" monster from your hand. Lore: (Quick Effect): You can reveal this card from your hand, then target 1 Level 3, 5, or 7 WIND monster on the field; Special Summon this card from your hand in Attack Position, and if you do, destroy that target. If this card leaves the field by a monster effect: You can add 2 "Mist Valley" monsters whose total Levels exactly equal 6 from your GY to your hand, but you cannot add cards from your GY to your hand for the rest of the turn. 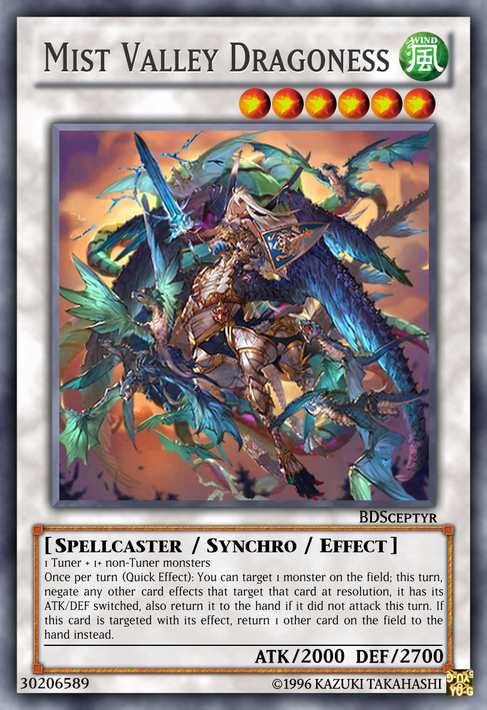 If this card is Synchro Summoned: You can discard 1 monster, and if you do, destroy 1 card on the field, and if you do that, if you owned that destroyed card, you can Special Summon 1 Level 2 or 3 monster from your GY. It cannot be destroyed by battle. Once per turn (Quick Effect): You can target 1 monster on the field; this turn, negate any other card effects that target that card at resolution, it has its ATK/DEF switched, also return it to the hand if it did not attack this turn. If this card is targeted with its effect, return 1 other card on the field to the hand instead. 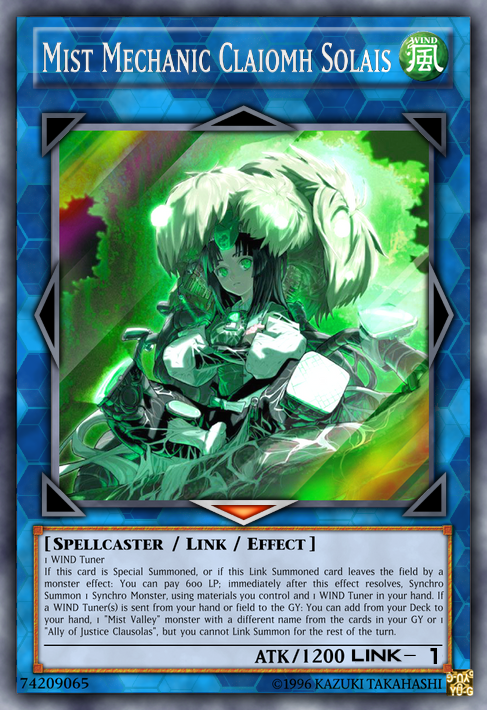 If this card is Special Summoned, or if this Link Summoned card leaves the field by a monster effect: You can pay 600 LP; immediately after this effect resolves, Synchro Summon 1 Synchro Monster, using materials you control and 1 WIND Tuner in your hand. 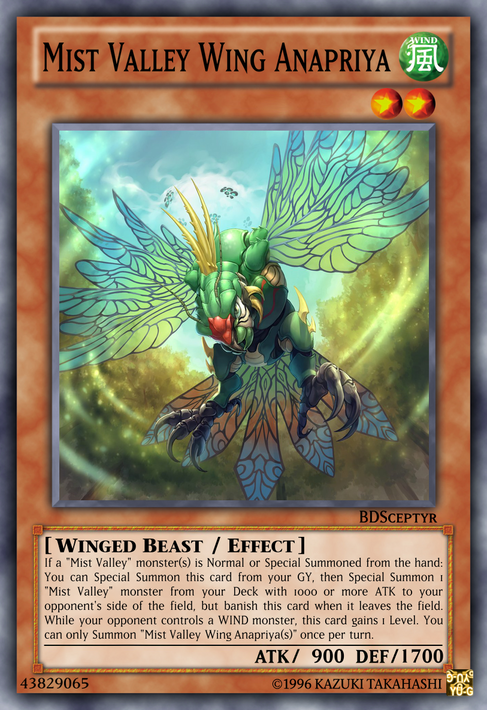 If a WIND Tuner(s) is sent from your hand or field to the GY: You can add from your Deck to your hand, 1 "Mist Valley" monster with a different name from the cards in your GY or 1 "Ally of Justice Clausolas", but you cannot Link Summon for the rest of the turn. 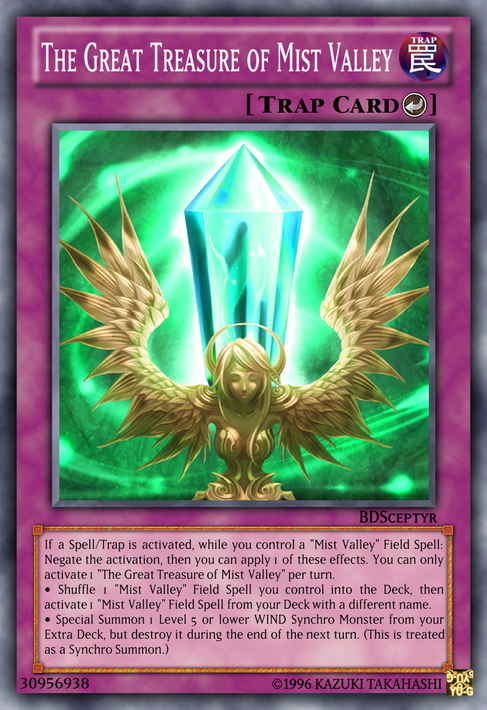 Lore: Once per turn: You can discard 1 card, and if you do, Special Summon 1 "Mist Valley" monster from your Deck, except a Tuner. Once per turn, if you Synchro Summon using a non-Tuner WIND monster you control, the other Synchro Materials can be "Mist Valley" Tuners in your hand. 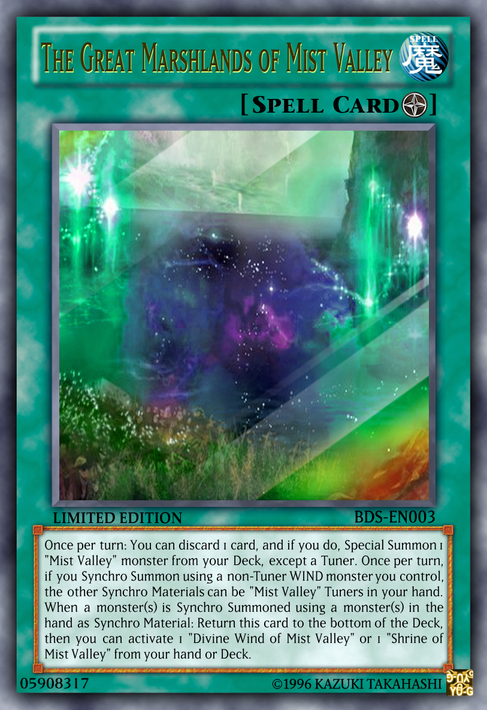 When a monster(s) is Synchro Summoned using a monster(s) in the hand as Synchro Material: Return this card to the bottom of the Deck, then you can activate 1 "Divine Wind of Mist Valley" or 1 "Shrine of Mist Valley" from your hand or Deck. Lore: When you control a "Mist Valley" monster: All "Mist Valley" monsters you control are unaffected by monster effects, also any card your opponent controls that leaves the Monster Zone this turn is banished instead. 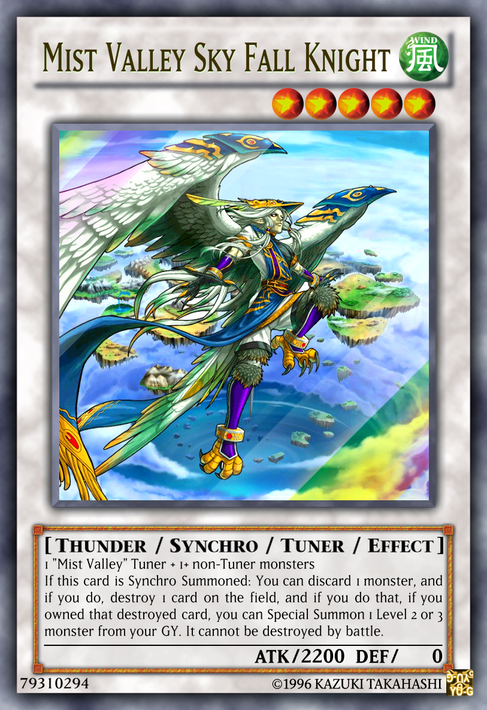 If you control a Thunder or Winged Beast Synchro Monster, you can activate this card the same turn it was Set. Lore: Target 1 "Mist Valley" monster you control and 1 card your opponent controls; return 1 of those targets to the hand, and if you do, send the other target to the GY, then if you sent a monster(s) to your GY by this effect, your opponent must shuffle 1 monster in their hand into the Deck. 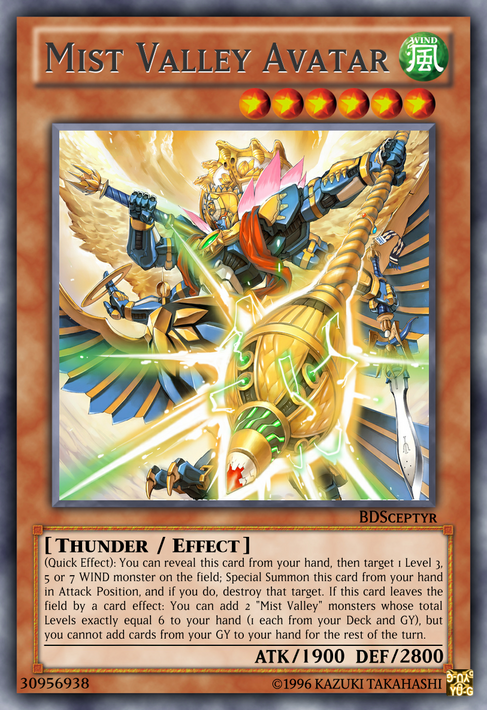 If you control a Thunder or Winged Beast Synchro Monster, you can activate this card the same turn it was Set. Lore: If a Spell/Trap is activated, while you control a "Mist Valley" Field Spell: Negate the activation, then you can apply 1 of these effects. You can only activate 1 "The Great Treasure of Mist Valley" per turn. • Shuffle 1 "Mist Valley" Field Spell you control into the Deck, then activate 1 "Mist Valley" Field Spell from your Deck with a different name. BD'S signing off. And there will be more cards coming. UPDATE I: Have the final draft of my old Mist Valley support. UPDATE: Everything is up now, including a new Synchro for them that can offer protection, bounce problematic stuff, even switch up stats. Edited by Black D'Sceptyr, 19 December 2018 - 10:54 PM. UPDATED: with the new Great Marshlands, the Mist Valley Sky Fall Knight, and the Great Treasure of Mist Valley Counter Trap. Final update, with the new cards, chief of them the Mist Valley Dragoness.